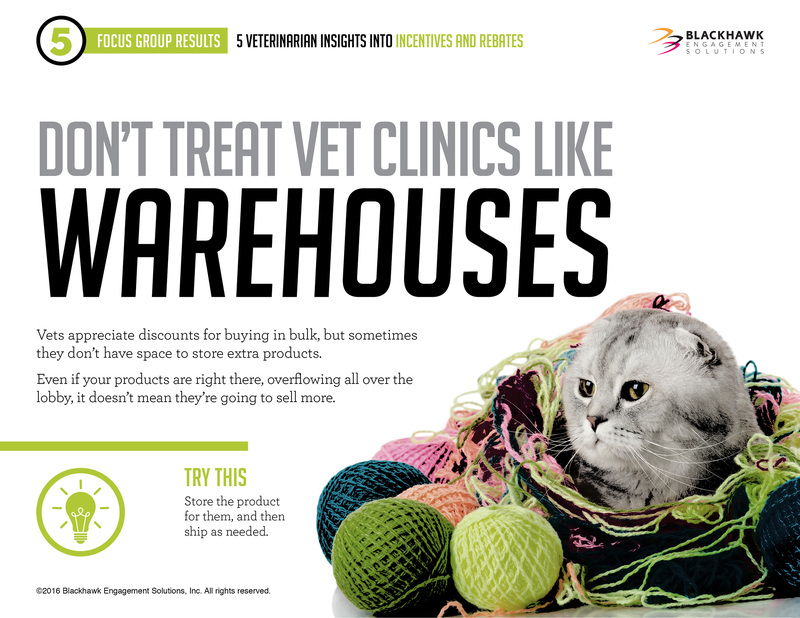 PR Newswire, LEWISVILLE, Texas – November 15, 2016 – Blackhawk Engagement Solutions, a global incentives and engagement company, today announced new research that informs pet pharmaceutical companies on what veterinarians and their techs need and want in the way of promotions and incentives to sell companion animal pharmaceuticals. 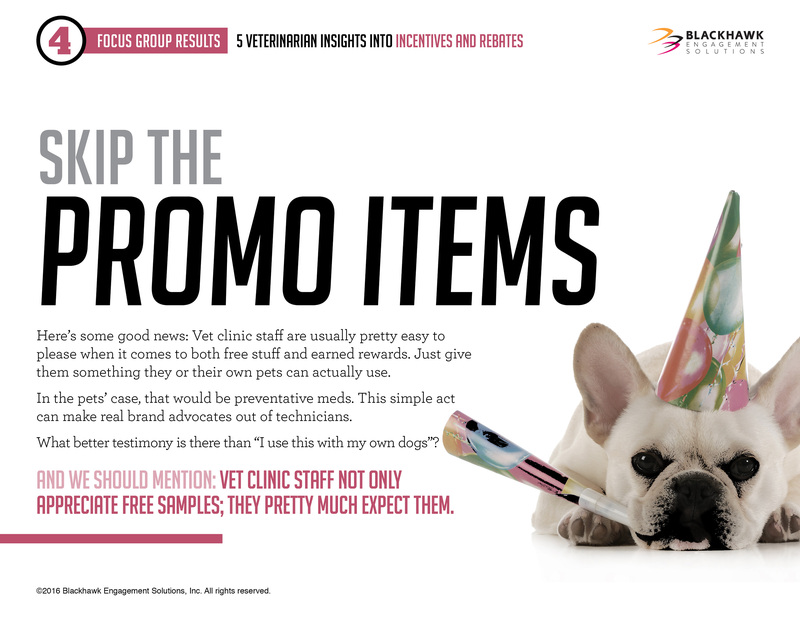 Blackhawk Engagement Solutions published the research in a new ebook, 5 Veterinarian Insights Into Incentives and Rebates*. The qualitative findings are the result of an interview series with 16 pairs of veterinarians and vet technicians. 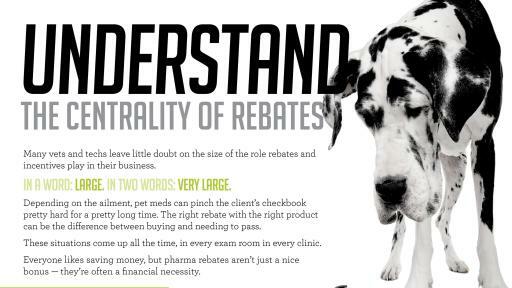 Rebates and incentives can play a major role in the pet pharma industry. Pharmaceutical sales account for a significant percentage of clinic revenue, and rebates and incentives programs encourage clients to return regularly, especially when pets have chronic conditions. Programs that provide incrementally better rewards as purchase patterns grow over months and even years can create opportunities for clients to pay for products or medications that might otherwise be unaffordable. 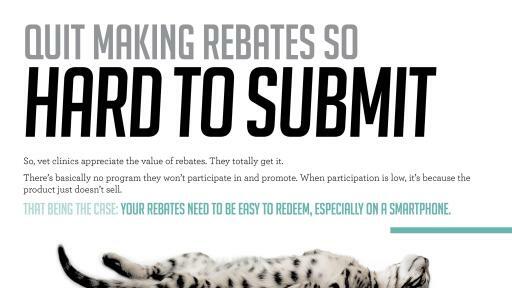 Rebates should be easy to redeem. The vets and techs interviewed for the research appreciate the value of rebates for their own interests and those of their clients. 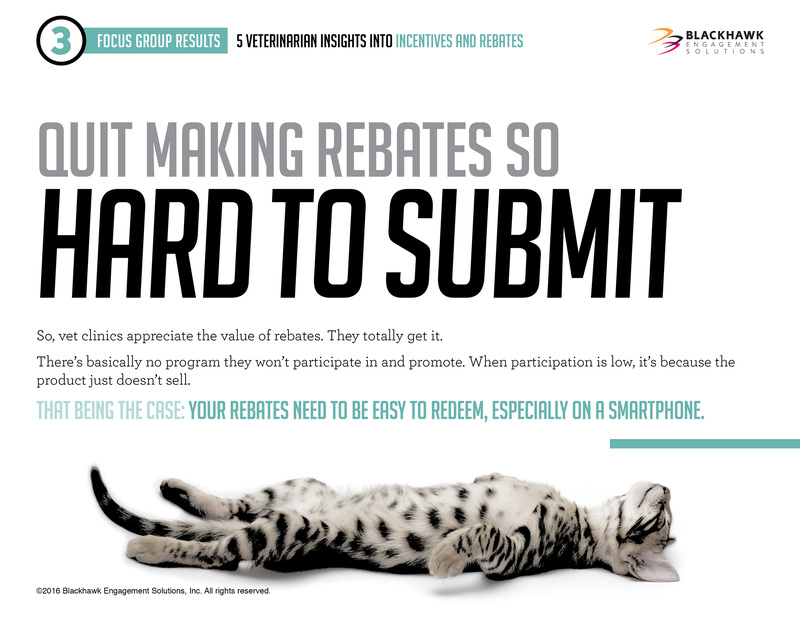 Convenience and rapid reward delivery are key, and practices want to increase the likelihood of redemption by ensuring clients can quickly and easily redeem their rebates through programs that offer mobile-first and online rebate submission options. There is a need for educational tools. The clinic staff interviewed want to learn how to speak with more authority about the pharmaceutical products they recommend and what other clinics are doing that make them successful. Tools such as materials explaining product benefits and risks, in-person education via lunch-and-learns, mock visits and coaching, and continuing education credits are on their wishlists. Vet practices want incentives to help drive compliance with medication prescriptions. Whether for chronic conditions or preventative treatments, veterinarians want to encourage clients to give pets recommended medications using the prescribed schedules and dosages. Incentives that remind or enable clients to buy and administer medications, including those for year-round prevention for heartworm, fleas and ticks, are in demand among those interviewed for the research. 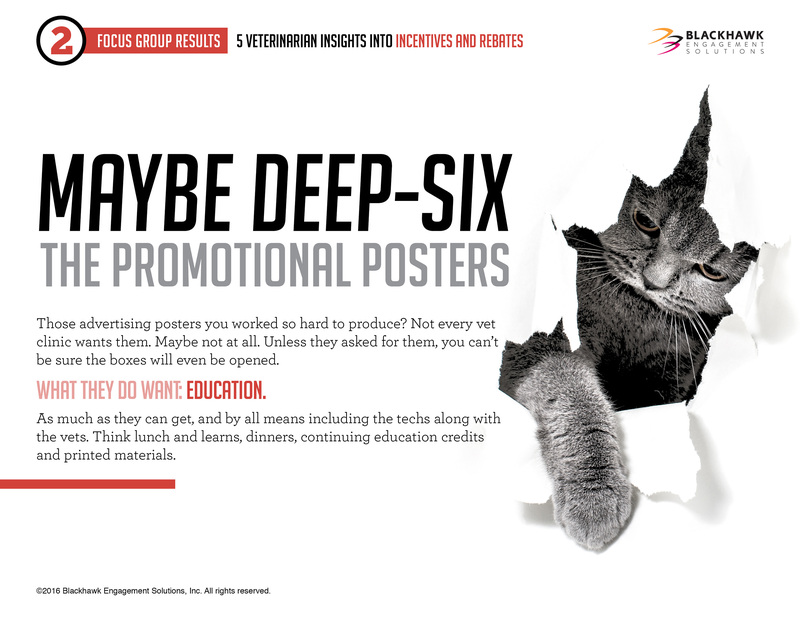 Posters and other promotional items are ineffective. 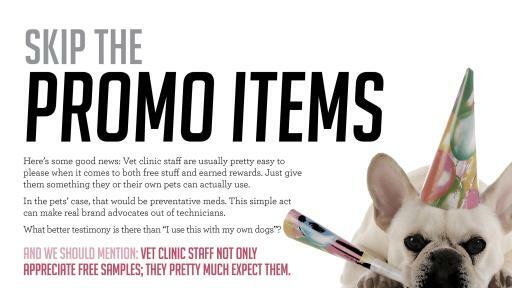 Providing clinics with unsolicited advertising in the form of posters and promotional items to share with clients is a waste of time and resources, according to the vets and techs interviewed. Instead, they prefer to educate clients via free samples, regular pet care tips, text reminders for preventative care and informative printed materials. 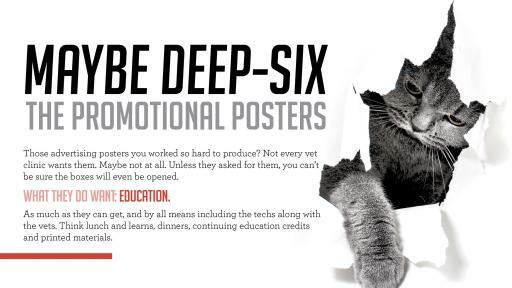 Vets and their techs want to be rewarded, too. 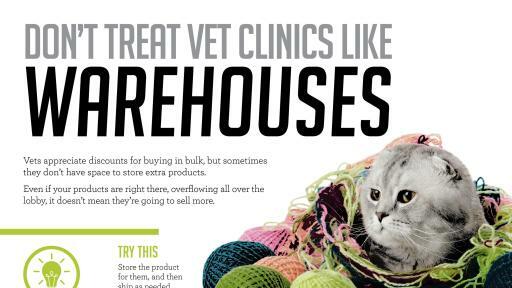 Company outings and team events aren’t as popular as they once were, according to the clinic staff interviewed, but prepaid gift cards and preventative meds for their own pets can reward vets and techs for sales in addition to creating strong brand advocates. They also appreciate incentives for buying in bulk, such as discounts paired with storage and shipping options for facilities that don’t have the space to stock extra products. Blackhawk Engagement Solutions is a division of Blackhawk Network, an organization that develops new ways to give, receive and use branded value—including digital rewards, rebates and offers, and gift cards. 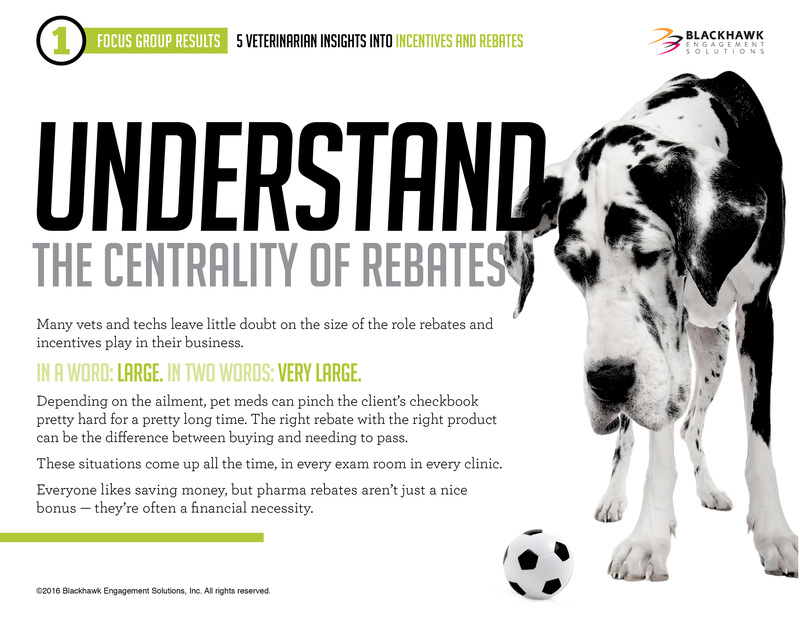 The “5 Veterinarian Insights Into Incentives and Rebates” study was a qualitative, interview-based survey conducted by Blackhawk Engagement Solutions in the summer of 2016. The sample size of 16 pairs of veterinarians and technicians was based in St. Louis, Dallas, Orlando and Atlanta. Interviews generally lasted up to 45 minutes and took place in person or over the phone. Topics included clinic operations, consumer incentives and rebates for preventive medications, staff incentives and rebates, clinic incentives and ideas for improvement. Blackhawk Engagement Solutions is a leading global provider of customized incentive and engagement solutions for sales incentive programs, consumer promotions and employee rewards and recognition. We are a strategic partner with many of the world's leading brands and a thought leader that provides game-changing engagement solutions. Through our products, services and innovative technology, we inspire actions that impact results. For more information, please visit: www.bhengagement.com.